Each MPLAB® X project can have its own tools, the connection to the hardware is made after Debug & Run is requested. When using one or few projects, keeping the tools always connected always (not just at runtime) saves initialization time. When switching projects with this option selected (e.g., when developing bootloading applications), this option ensures tool and device are the same to avoid error messages. This option also saves time when you select debug run again because the tools are already connected to the project and don't need to be initialized again. 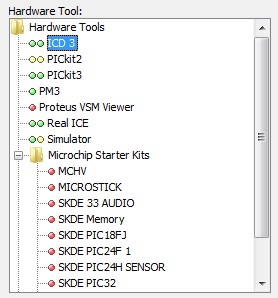 The following steps demonstrate how to maintain connections to the hardware tool. Select " Maintain active connection to hardware tool"